Michael Jordan once said: “You can have all the physical abilities in the world but you still have to know the fundamentals”. It is well known that Michael Jordan was cut from the basketball team in his youth. Driven, he practiced diligently, made the team the next year, and transformed into one of the greatest basketball players of all time. This anecdote points out the importance of diligence, fundamentals, and practice. When people want to learn to surf after seeing surfers in the water, they often overlook the important fundamentals surfers use on a regular basis. Surfing is so much more than “see a wave, paddle, stand up, surf, repeat”. When taking a surf lesson, the instructor’s experience makes up for the inexperience of the participants. They choose the wave. They tell you when to paddle, when to pop up, etc. For an awesome surfing experience, this is the fastest route. But how do you become the pro? How do the instructors get to where they are? It all comes back to fundamentals. The fundamentals for surfing would be wave dynamics, conditions reading, and paddling. If drills teach you basketball fundamentals, then boogie boarding teaches surfing fundamentals. Boogie boarding (aka body boarding) is an often overlooked sport because it does not have the hype that surfing has. You are lying down instead of standing, the board isn’t as hydrodynamic, and the tricks usually aren’t as flashy. So, why don’t you just skip this and go straight to placing time and effort into surfing? One of the most difficult things to learn to do in surfing is paddling and catching waves. Hydrodynamic boards aren’t typically very stable without proper muscle control so prospective surfers often can’t stay on their board, let alone paddle effectively. Paddling is also exhausting. Many new surfers can’t make it out past the break before becoming too exhausted to continue and have to turn around. Boogie boards, though less hydrodynamic, float relatively well and are quite wide. You typically start boogie boarding where it is shallower, where you can stand. This allows you to use your legs to push off and kick as well as paddle instead of solely relying on your arms. While the new surfer is still paddling out and getting tired, you are steadily building simple control muscles in your core, conserving energy, improving your balance and paddling, and are already moving to the next set of fundamentals, wave dynamics and catching waves. By wave dynamics, we basically mean how waves work. The average individual doesn’t really need to know the science of “wave dynamics” when learning boogie boarding or surfing. We are more speaking of the practicality behind it. Most of this takes trial and error to learn, but if you know that waves begin to break over a sand bar, you can deduce that waves break in shallower water and not necessarily in deeper water. By this you can begin to choose where to go out. As you gain more experience, this gets much more specific with reading conditions like tides, wind direction, swell direction, etc. but basically, you learn where to be to catch the wave. Now for the fun! Learning to catch waves on your own is also a trial and error process. You have to paddle at the right time, be in the right place, go the right speed, etc. We guarantee that even your instructor has missed exponentially more waves than they’ve caught over their careers. It simply takes time and repetition. We have established that boogie boarders are already catching waves before the new surfers and they are using less energy to stay out there and catch them, so they catch more waves. More practice! Also, wipeouts are typically easier and softer. The board is softer, less prone to damage, and doesn’t really hurt if it runs into you. Catching a wave, balancing, and paddling on a boogie board are directly transferable skills and take less energy to learn on a boogie board than they do surfing. Since it is easier to do but teaches directly applicable skills, we start all of our kids programs with boogie boarding. Our youngest camp, Guppy Camp, even solely boogie boards as their water sport. 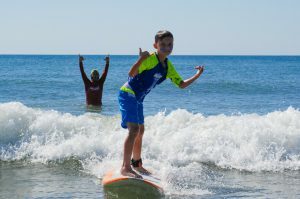 Our Grom Academy and our Carolina Ocean Odyssey programs both start with boogie boarding to build the basics and confidence before moving to surfing later in the week. Adults can start with just surfing as they are stronger in general than children but if you are looking to inspire your child to become a lifelong surfer, start them on a boogie board.